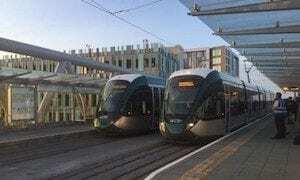 The expanded network has more than doubled the existing tram line, with 17.5km of new track and 28 new stops to the South and Southwest of the city, linking directly with the existing NET Line One at Nottingham Station. The total tram network is now 32km in length, serves seven park and ride sites, and is able to cater for up to 20 million passenger journeys a year. An integral part of incorporating the new Beeston and Clifton lines into Nottingham’s congested road network was the construction of no fewer than 11 major structures including the new Karlsruhe Friendship Bridge over Nottingham station. The joint venture built all associated infrastructure for the project, including overhead wires, track and signalling.